I've been playing on the sunporch again. Sort of like Meryl Streep at the Oscars. Gosh, I love that woman...she is so down to earth. I know why I like piddle-ing out here. It's because it's sort of like playing "dress-up". and now dream of Spring, that feels right around the corner. Someday when I'm brave I'll show you where I keep all my pillows and quilts. I love changing out the color schemes with each new season. can Easter be far behind? and lovin' the warmer weather! is still on until Saturday at Midnight. I love the floral bouquet of roses white plate! I love everything in her shop in fact. Yes, I follow both of you. I'd love to be that Kitty Cat, curled up on that wicker love seat. 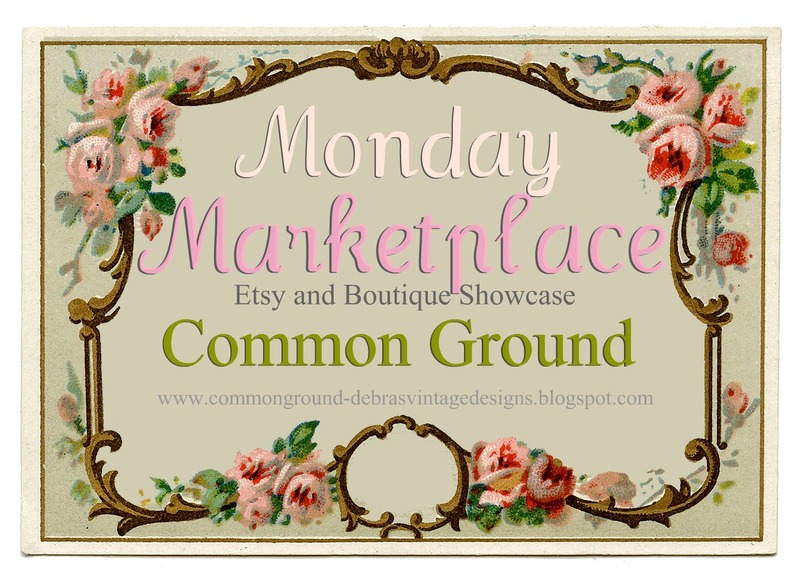 Love all your new spring vignettes! I never tire of seeing it, Debra! 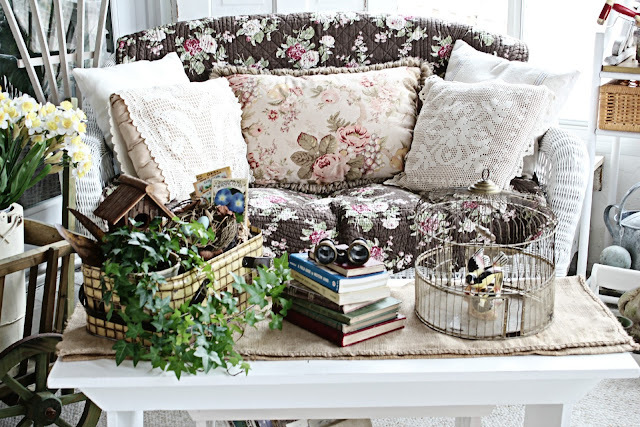 Love the quilt on the wicker loveseat and all your touches of Spring! A most lovely place! Every detail, every vignette is beautiful! I love your sunporch and how cozy it feels! I wish I had one to go and relax like your kitty cat! Debra I never get tired of seeing your pretty sun porch! Love that floral arrangement on your door and what a sweet pic of your kitty! Such pretty touches! Love that green toolbox! And your cat definitely has the right idea...c'mon Spring! 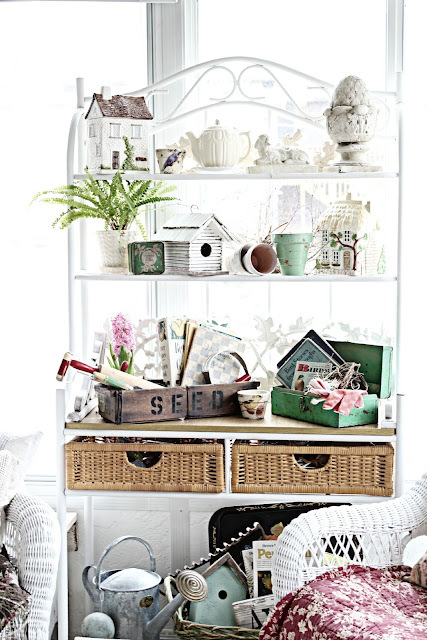 I adore all the spring touches on your sunporch! I adore the porch!! See now, that cat has the right idea....snoozing while someone else pretties things up! Looks so cozy! Gosh, I LOVE your porch! Your hyacinth bulbs are lovely! Debra I love your porch.It is a dream of mine to someday have one.I love how you change it out.I am sure you are looking forward to sitting out there and looking at your flowers.Your kitty sure is enjoying it. I never get tired of visiting you on your porch:) Love the springy looks! Enjoy your evening dear Debra, HUGS! Your sunroom is so pretty and romantic looking. I don't blame you for "playing" out there. I like all of your touches of Spring too. That looks so pretty and inviting and the cat sure does look content! what a lovely room just beautiful I love all the touches. I love what you have done to your porch!! So, inviting and comfy. The fleurs are beautiful. I love the arrangement on the mirror! Debra, I never tire of your sunroom, or your pictures, or your blog...it is always wonderful. Like looking at my favorite magazine! Yay. It looks wonderful too. Love it. Love the new attire on your wicker. Very pretty. Lovely! Put me in a "ready for spring" mood. Your collections each season are a delight to see. Debra, I would never tire of seeing your sun porch. I love it. Your porch makes me feel like spring is right around the corner!! Lovely! Like the cat...who has the best seat in the house...I love your changes on the wicker loveseat! Your birdhouses are similar to the ones my Dad built for me as he was recovering from open heart surgery 15 years ago! You've inspired me to change the hues of the birdhouses for this coming Spring! About the Oscars...I hope she wins again, and again, and again!!! aahh I wish it was spring already but am loving the pictures...time for me to start changing over to "the garden look." Just lovely porch. But you hoard and display in such a nice way! How do you do it? Your secret is safe with us.... in fact many of us are probably thinking, what's the matter with being a hoarder??? The birdie items are wonderful...love the vintage birdcage the best. Thank you for sharing! Debra, it's all so pretty! And your sweet kitty has the right idea! Love your teapots! Lazy cat and all, why not snooze in this comfy beautiful room that ready for spring. What a cozy place to be. I am sure that you enjoy hours of calm there. Your piddling payed off everything is just fabulous. Ahhh, Debra everything looks cozy and so springlike! love it. and your kitty is just enjoying it to the hllt isn't she? I love all your quilts and pillows, I and my sis both have a passion for that stuff. it's best to keep us out of places like Bed, Bath and Beyond, cause we have no more room to store. You have to sneek us a peek at where you keep them hidden! IF I had that pretty porch I would want to be out there playing all the time too. You lucky girl. LOVE the wicker piece & the table from your Daddy... be still my heart. Those gifts our Daddy's give us never cease to comfort us do they? THANK YOU for sharing this spot of beauty. I NEEDED that in my day today. HUGS! I like all the decoration pieces. I was just wondering where you kept your stash. You seem to just pull pretty outta thin air! Tell kitty kitty...that's MY seat! I love your sun porch it makes me want to sit and have some tea. Very beautiful. What a great space...the vignette of objects in the basket it adorable. Debra ,I love that sun porch of yours, and every chance you do it through the year. The bouquet you made to hang is so naturel and beautiful-and the spring colours in there, lovely. What a pretty porch, Debra. No wonder you enjoy 'fussing' with it. Nancy was kind enough to post your link on her blog and I'm so glad she did. I'll be stopping by again! I will never tire of seeing your fabulous porch. Simply gorgeous. You have a beautiful sunporch. I like it when you "piddle"....we get to see some amazing pics! I KNEW that was your pretty little porch in that photo, Debra! I hurried to click on it because I knew you had changed it up for springtime - and it's beautiful! That chocolate quilt on your settee is so rich looking! Another beautiful transformation, sweetie. :) And...uh.....someone knows a comfy spot when they see it. lol! Your sunporch is lovely. I envy you and wish I had one too. I love your wicker and the beautiful quilt and pillows are perfect. When it comes to quilts I am a hoarder too. Your kitty certainly knows how to enjoy a sunny afternoon. All your vignettes are wonderful. So lovely and it sure does feel like spring. Your displays are stunning! I can certainly see why your beautiful cat loves that spot. I have a fluffy gray cat that looks just like yours. BTW I found your blog through Met Mondays on BNOTP. Have a wonderful Monday! Love your beautiful quilt (and entire porch), Debra! Thank you for linking it up with air your laundry Friday. Featured you!